Since 2012 I have been focusing primarily on my own groups KLAS NEVRIN TRIO and KLAS NEVRIN ENSEMBLE, with Ricard Österstam drums, Vilhelm Bromander bass, Katt Hernandez violin, and Per “Texas” Johansson reeds. 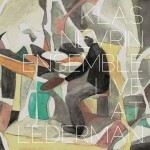 In May 2014 the Ensemble released the CD “Live at Lederman”. Since September 2015 we have expanded into an international Octet as THE REVOID ENSEMBLE, adding Audrey Chen vocals & cello (USA), Anna Lindal violin and Eivind Lønning trumpet (NOR). During 2016-2108 this group will also be involved in a 3-year artistic research project called MUSIC IN DISORDER, funded by the Swedish Research Council and the Swedish Performing Arts Agency, established at the Royal College of Music in Stockholm. The project involves the eight musicians participating in THE REVOID ENSEMBLE and continues the work that originated with the pedagogical-artistic workshop MUSIK I OORDNING that I created together with Österstam and Bromander. Me and Ricard Österstam used to play together a lot during the 1990′s in different constellations. 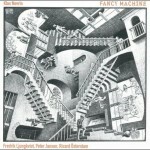 In 1999 we released the CD FANCY MACHINE. After some years on separate paths I’m very happy to be able to work with Ricard again! He’s an incredibly gifted musician and I always enjoy his devotion to the creative processes of music-making, and to life itself. 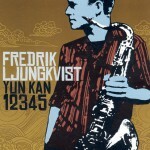 Since 2004 I’ve been a member of the free jazz groups YUN KAN 5 and YUN KAN 10, led by saxophonist Fredrik Ljungkvist. The quintet has released two albums — Yun Kan 12345 (2004) and Badaling (2007) — and was acclaimed “Jazz Group of the Year” by the Swedish Broadcasting Corporation. The tentet released the double CD Ten in 2013, with raving reviews. All About Jazz called it “a masterful achievement” and “one of the best releases of 2013″. Downbeat hailed it as a “stunning debut”, gave it 4 1/2 stars, thus being one of the top CDs in 2013. The groups have toured in Canada, Norway, UK, Slovenia, Denmark, France and China, among other places. It’s been, and continues to be, an incredibly important experience for me to work with such fantastic musicians, not least forcefully driven by Fredrik’s versatile playing and his intelligent compositions. I also really enjoy playing with HONEYLEAP, which includes me and Fredrik as well as two very gifted Norwegian musicians – drummer Øyvind Skarbø (Trio 1982) and bass-player Per Zanussi (Zanussi 5/13, Trespass Trio). 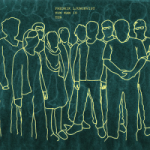 In June 2012 we recorded a Live concert at Biermann in Oslo, and this was released in February 2013. Me and Fredrik also play together in various other projects, including a trio with Joe Williamson on bass, and another trio called THIRD STREAM, with celebrated jazz-vocalist Lina Nyberg. The latter group reinterprets old standards from the 1920’s and onwards, inspired in various ways by the Third Stream movement of the 50s. We have received very positive reviews: “This is great art flowing from the stage!” (Johan Skoglund, Norrländska Socialdemokraten). “The group opens new dimensions in these old songs that one never thought were possible to find” (Lars Grip, Orkesterjournalen). Recent collaborations include: MURMUR with Laura Schuler (violin, CHE) and Rea Dubach (voice, CHE). Trio with Mariam Wallentin (voice) and Elsa Bergman (bass). Quartet with Mat Maneri (viola, USA), Susana Santos Silva (trumpet, PRT) and Torbjörn Zetterberg (bass). Quartet with David Stackenäs (guitar), Per Texas Johansson (reeds) and Christopher Cantillo (drums). Another important collaboration is the duo CASUAL INTIMACY with bansuri-flutist Richard Ekre-Suzzi. Our friendship stretches back more than 25 years, and we started out playing around with two pianos and studying music theory together. Richard studied for many years with the legendary bansuri-player Hariprasad Chaurasia in India and Netherlands. Richard’s musicianship and his personality continues to always inspire me, with a presence and a creativity that is unusual. I believe that the music we create together, although all too rarely in public, is really deeply personal! 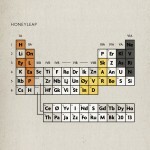 Perhaps it is something that only happens when you’ve known each other for that long?